Team Sky's riders only learned about the squad's sponsorship news Tuesday night, hours before it was announced. No one saw it coming. Riders arriving to Team Sky’s winter training camp Tuesday didn’t have a clue. It was a secret team principal Dave Brailsford held close to his chest. The cycling community woke up to the stunning news that Sky, the main sponsor that’s bankrolled cycling’s richest team for the last decade, was pulling up stakes by the end of 2019. Team Sky sent shockwaves around the peloton Wednesday, but this time it wasn’t for searing attacks in the Alps. Everything seemed to be unfolding like any other team camp to kick-start a new racing season. Staffers had already been on hand for a few days. The riders started to arrive to Spain’s sunny Mallorca. Chris Froome was back from spending time in Colombia with former teammate Rigoberto Urán. Geraint Thomas, now the toast of England, was back in the saddle after a busy off-season that included appearances on some of the UK’s top chat shows. The mood was jovial. After winning the Giro d’Italia with Froome and the Tour de France with Thomas, spirits were sky high. Riders and staff hadn’t seen one another since the season wound down in October. Everyone was keen to get “stuck in” and map out the 2019 season. First came a training camp tradition. Ever since Team Sky started coming to the northern shore of Mallorca for its winter training camps nearly a decade ago, the team always opened its stay with a boisterous team dinner. Everyone gathered around in a private affair as management handed out prizes and awards for staffers and riders. It’s an intimate moment to share a few laughs and relish the previous season’s successes before getting down to work. And then around 10 p.m., team principal Dave Brailsford stood up and made an announcement that no one was expecting: Sky, the team’s main backer since its inception, would be leaving at the end of 2019. Jaws dropped, a few gasped. Everyone was stunned. No one knew. Not even the team’s top stars had a clue about what Brailsford had found out a few weeks ago. It was information that Brailsford was keeping close to his chest. It all started last summer, when media icon Rupert Murdoch put Sky plc, the British media company he founded three decades ago, on the market. As Froome was winning the Giro and Thomas was ripping across the Alps, an intense bidding war commenced for one of the largest media empires in Europe. After a months-long battle, U.S.-based Comcast came out on top with a blockbuster deal worth $38 billion in late September. Though far from the minds of the Wall Street dealmakers, the questionable future of Team Sky soon had tongues wagging inside the peloton. Would Sky lose its “angel” sponsor that fueled its unrivaled dominance of the Tour de France, delivering six victories by three different riders? In the background, a few tremors might have been felt even as far away as Sky’s Manchester, England headquarters. On October 9, James Murdoch resigned from Sky’s corporate board. The son of Rupert Murdoch, James was an essential Brailsford ally. He served as Sky’s chairman of the board from 2007-2012 and green-lighted the biggest sponsorship deal in cycling history. With Murdoch gone in the wake of the Comcast deal, Brailsford could no longer count on a key in-house booster. Even with Murdoch’s departure, initial indications were that it would be business as usual despite the corporate merger. At least that’s the early understanding that team insiders had. 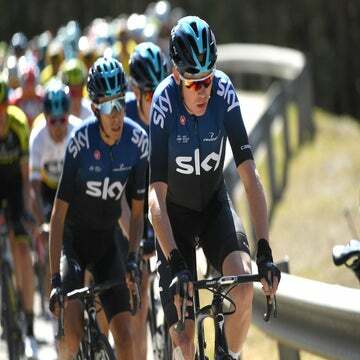 Brailsford continued bolstering his squad, not only for the 2019 season but also for a future that doesn’t include four-time Tour winner Froome. Over the course of several weeks this fall, Brailsford finalized a deal with current Tour champ Geraint Thomas through 2021. He was quietly working on a deal to bring promising South American climber Ivan Sosa to the team. His biggest move came when he signed Colombian sensation Egan Bernal to a five-year contract in early October. Those are not moves from someone expecting his sponsorship deal to end in a little more than 12 months. Then something changed inside the Comcast corporate offices. Publicly, officials have only said the decision to end Sky’s sponsorship was due to a change in direction. According to sources, Brailsford received a call “about two weeks ago” to attend a meeting in London. That would put the date in late November. Brailsford was described as being “surprised” by what he soon found out: the sponsorship was due to end at the conclusion of the 2019 racing season. Over the next several days, Brailsford quietly revealed the news to only a few key trusted senior members of the management staff. None of the daily staffers or riders got a whiff of the blockbuster news. Without giving too much away, Brailsford also started to put out feelers to search for new title sponsors. The team confirmed it has not hired outside consultants to help in a sponsor search, at least not yet. Brailsford kept up public appearances, not wanting to tip his hand. The team even posted an Instagram photo of Brailsford speaking at a team meeting on Tuesday afternoon, just a few hours before he would reveal the news to everyone else within the organization. Wednesday’s announcement that Sky is pulling out comes on the very same day that another British powerhouse, the McLaren Group, announced a deal to become a 50 percent owner of the Bahrain-Merida team. On Wednesday morning, the official press releases were sent out. The team promised to keep a stiff upper lip and get on with the business of racing. Brailsford was scheduled to speak to British media. It was cycling’s best kept secret.